Wow! Our players really heated up the blogosphere with these entries. We had such a great variety from sorching hot suns to blazing landscapes to steamy scenes to flaming femmes! Thanks to all who played! Your art was smokin' hot! Congratulations, Gayle. Your artwork will be showcased on the Home Page of the Gingersnap Creations Yahoo Group as well as on the sidebar on the blog. Now onto our fabulous Ginger Gems. When each challenge closes, we also usually pick 7 Ginger Gems - fabulous creations that we feel really exemplify that challenge's objective. 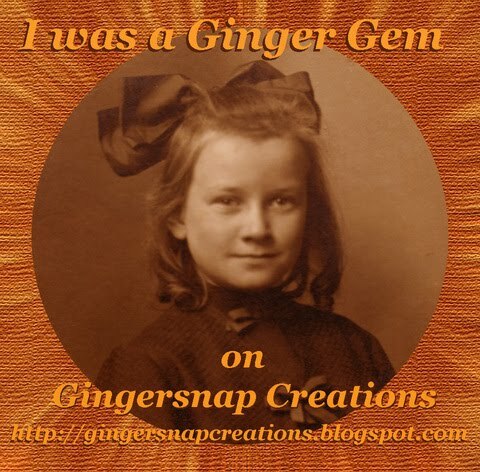 The Ginger Gems appear in a slide show in the blog sidebar for the entire week, as well as in this wrap-up post, and their creators have the honor of displaying this Ginger Gems blog badge. As there were way too many fabulously hot creations, we actually selected 8 Ginger Gems for this challenge instead of our usual 7! Congratulations everyone. What a fabulous and varied collection of artwork. Congratulations Gayle and all the lovely Ginger Gems. I am so excited to have been selected as a Ginger Gem - Thank you so much!!! Congrats to all! Thank you for choosing me as one of the Ginger Gems. I can see why you had a hard time picking. I'm amazed at the other creations, just awesome, each of them! Congrats to all but especially to Gayle! What a lovely surprise to be chosen as a Ginger Gem - first time for me. Thank you. Wow-- that's some spectacular art going on! Congrats to all the Gems and to Gayle, for her HOT card. Bravo, everyone! Congrats everyone! Such a nice variety of art! Hoooooo, that is some hot, hot artwork!! Congrats everyone!